This is an update of the post about antievolution legislation posted on 17 April, 2013. The 2013 state legislature sessions are either coming to a conclusion or have adjourned. After a relatively unsuccessful 2012 in passing anti-science laws (with the notable exception of Tennessee’s Monkey Bill), the conservative Republicans seemed to have mostly failed to end real science teaching from our kids. 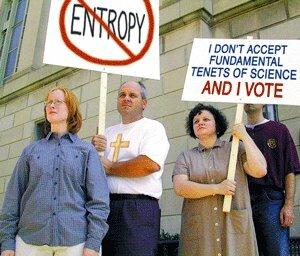 The current forms of anti-science legislation attempt to allow teaching creationism (or more subtle forms, like intelligent design), usually combined with climate change denialism, and, strangely, anti-human cloning (which is not exactly a serious line of research today). But whatever the general anti-science bent of the legislation, it has always been clear that promoting creationism is the goal. Creationism refers to the belief that the universe and everything in it were specially created by a god through magic, rather than a natural, scientifically explained, process. Creationism explicitly relies on the claim that there is a “purpose” to all creation known only to a creator. Without a doubt, creationism is a religious belief, and no matter what argument is made (and I could write 50,000 words on the topic), creationism is not science because it relies upon a supernatural being, which means it can never be falsified, one of the basic principles of the scientific method. The supporters of creationism attempt to claim that creationism is a scientific theory on the level of evolution, ignoring the fact that a scientific theory is “a well-substantiated explanation of some aspect of the natural world, based on a body of facts that have been repeatedly confirmed through observation and experiment.” Creationism is generally based on a fictional book. The Establishment Clause of the First Amendment to the United States Constitution, specifically prohibits any government entity from establishing a religion (which courts have ruled to include teaching religion in schools). Decades worth of Supreme Court rulings have found that teaching creationism in schools is equivalent to teaching religion. As recently as 2005, in Kitzmiller v Dover Area School District, a Federal Court continued the tradition of considering creationism as religion, and ruled against a school district, costing the Dover Area School District nearly $1 million in legal fees. That money probably could have been used to teach their students better science. Colorado. A bill in the Colorado House (HB 13-1089) was offered that used the “academic freedom” canard which allows the teacher the “freedom” to teach whatever “theory” or belief of science they want, including the non-scientific creationism. What was particularly offensive about HB 13-1089 was that it was going to make the same requirement in Colorado’s schools of higher education. I could not imagine that a faculty member in the Department of Geology at the University of Colorado would teach a basic geology course by explaining that the world is only 6000 years old. And be protected by law. Lucky for science education in Colorado, it failed to make it out of committee, albeit by only a 7-6 vote. Arizona. Another antievolution and climate change denier bill, introduced in the Arizona Senate, SB 1213, uses the same “academic freedom” strategy to “create an environment in schools that encourages students to explore scientific questions, learn about scientific evidence, develop critical thinking skills, and respond appropriately and respectfully to differences of opinion about controversial issues” and to “assist teachers to find effective ways to present the science curriculum as it addresses scientific controversies.” This is the first attempt in 10 years by Arizona to force anti-science on Arizona students. On February 25th, SB 1213 died in committee. Indiana. HB 1283, very similar to one introduced last year, is a fairly creative and “stealthy” bill that actually doesn’t mention evolution or climate change directly. Instead, it uses the “academic freedom” canard broadly to the teaching of any scientific, historical or health theory. So it would give cover and protection to any teacher who stood up in front of biology class and babbled on about creationism as being factual or a theory equivalent in scientific strength as evolution. HB 1283 failed to get a “third reading” in the state House, so it died. Missouri. Two bills were introduced in the state’s House: HB 179 and HB 291. The former bill is the typical “academic freedom” bill which provides legal protection to any teacher who wants to push their religious beliefs on Missouri students. The latter, HB 291, specifically allows for the teaching of intelligent design as equivalent to the theory of evolution, despite the Kitzmiller ruling where the court stated that intelligent design is nothing more than a religious doctrine. Both bills died in committee on May 17, 2013. Montana. The state’s House introduced HB 183 which was intended to allow teachers to teach the scientific controversies in evolution and climate change. The nonexistent controversies of course. It was tabled by the Montana House Education Committee, so it’s going nowhere. Texas. HB 285, which would have amended Texas’s education code to provide that “[a]n institution of higher education may not discriminate against or penalize in any manner, especially with regard to employment or academic support, a faculty member or student based on the faculty member’s or student’s conduct of research relating to the theory of intelligent design or other alternate theories of the origination and development of organisms.” The bill died in the House Committee on Higher Education on May 6, 2013, when the deadline for House committees to pass House bills expired. In other words, the Texas House didn’t even want to debate or discuss it, which is an amazing conclusion to this bill, considering it is Texas, one of the more Republican states. Kansas. Not strictly an anti-evolution bill, HB 2306 was introduced into the Kansas House in February, focusing on climate change. It stated that “the teaching of certain scientific topics, such as climate science, may be controversial” and encouraged “the teaching of such scientific controversies to be made in an objective manner in which both the strengths and weaknesses of such scientific theory or hypothesis are covered.” It died on March 1, without being considered by the Kansas House. North Carolina. Although not quite focused on evolution (or denial thereof), the North Carolina house is considering a bill, SB138, that gives credits to students who study the Old and New Testaments of the fictional bible in public schools. Within this context, creationism, of course, could be easily taught. The bill has been sent to committee, and there has been no activity on the bill since February 2013. Virginia. Actually I missed this one earlier in the year. The Virginia Senate briefly considered Senate Joint Resolution 287, which would have revised a portion of the state constitution that concerns freedom of religion. Among the revisions was the addition of a provision “that no student in public schools shall be compelled to perform or participate in academic assignments or educational presentations that violate his religious beliefs.” It was, in effect, a blatant attempt to allow students to reject evolution if taught or allow it to be taught directly to students without any legal or constitutional issues (or they believed). The legislation was sent back to committee twice, where it effectively died. Good. Within the scientific community, there are NO controversies with regards to evolution or climate change. Those theories are well established and are accepted by a broad consensus of scientists in the field. Scientists overwhelmingly (>97%) accept that organisms evolve over time. Over 97% of climate scientists accept anthropogenic global warming. If that’s a controversy, it’s a tiny, insignificant one, unless you think that 3% is a significant number of deniers. If someone wants to create a “scientific controversy” in these theories, they must bring scientific data and analysis from a world class laboratory staffed by world-class Ph.D-level scientists with that data published in a world class journal, subject to repetition, analysis and criticism by other scientists in other world class laboratories. A clueless politician in a right-wing state does not get to invent a “scientific controversy” by saying one exists. One has to show it, you just can’t claim there’s a controversy if there isn’t one. But this anti-science strategy of the right has consequences. It further reduces the USA’s technological competitiveness in the world. In fact, the World Economic Forum report on Global Competitiveness ranks the united states as 47th in quality of math and science education (see chart image above the fold). The USA ranks 38th in primary education. And if the US produces high school and college students who think that the earth is 6000 years old or that some supernatural creates organisms, then how are they going to do research in biomedicines, geology, diseases, and hundreds of other natural sciences? Companies that need those highly educated individuals will go where those educated students are located, whether it’s in other states or move the companies to countries who don’t allow religion in teaching. Or higher foreign-educated engineers and scientists. Anti-science legislation violates the constitution. It has economic consequences. And it destroys the science knowledge of children who will always be deficient compared to our world competitors. This doesn’t make sense. Anderegg WR, Prall JW, Harold J, Schneider SH. Expert credibility in climate change. Proc Natl Acad Sci U S A. 2010 Jul 6;107(27):12107-9. doi: 10.1073/pnas.1003187107. Epub 2010 Jun 21. PubMed PMID: 20566872; PubMed Central PMCID: PMC2901439.